Grace Baldwin on the steps of Harvard Medical School. Former Gift of Life Colby College Campus Ambassador Grace Baldwin has been accepted to Harvard Medical School and will begin her studies in August, 2018. Grace, 23, was honored by Gift of Life at the 2016 Gala in New York as the Campus Ambassador MVP for her outstanding accomplishments. 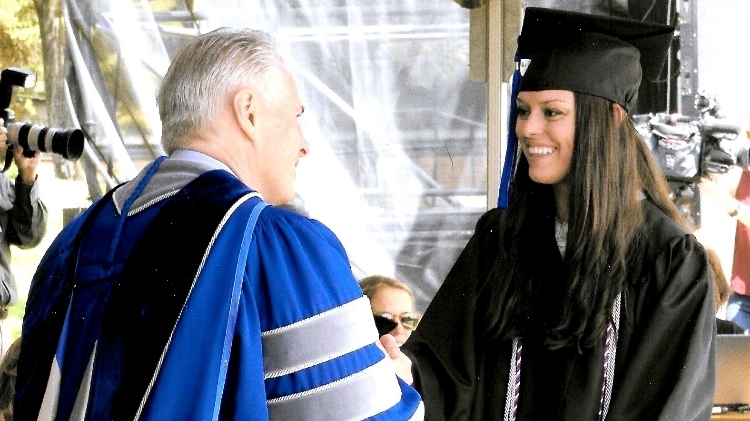 During her tenure as a Campus Ambassador Grace recruited more than 1,300 students to join the registry, comprising more than 68 percent of Colby’s undergraduate student body of about 1,900 students. She also raised more than $12,000 in contributions. To date, Her efforts have resulted in one lifesaving transplant and four matches for patients in need, with more expected in the future. While an undergraduate, Grace became interested in pursuing a medical career during her freshman year, and prepared by majoring in biology with a chemistry minor and taking medical school pre-requisites. She also plans to continue her involvement with Gift of Life, volunteering with the Young Professionals Committee in support of the Steps for Life 5k of Boston, and she hopes to hold donor recruitment drives to swab her fellow medical students at Harvard. Congratulations, Grace, from everyone at Gift of Life! We are so proud of your accomplishment and look forward to many more!